Dental crown is needed if a tooth has worn out by decay,had been root canal treated, has a very large dental filling or is heavily broken. The dental crown is fitted like a cap on the remains of the tooth. It has tooth color, making it look like a natural tooth to match the rest of your teeth to give you the confidence for a better smile. Dental crowns may be used as well to cover a tooth that may be on the brink of breaking, or is too broken to be restored with a filling. The cap is created from strong Zirconium material or metal bonded porcelain. It covers the tooth and creates like a second wall coverage. Dental crown procedure consists of two appointments. The first appointment consists of any decay rmoval from the tooth and shaping the tooth to accept the crown. After that an impression of the tooth is taken and sent to the lab. 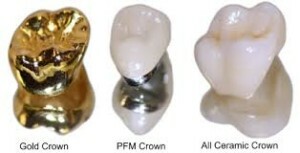 The crown is made of an all ceramic material, gold or usually of high strength porcelain over metal alloy. While you wait for the final fit, you may be provided with an acrylic or composite temporary crown to protect the tooth from breakage. After around 2 weeks during the second appointment the temporary crown is removed and permanent dental crown is cemented after few adjustments. Dental crowns may last from 5 to 15 years. Total period will depend on patient hygiene and dental crown care after the treatment.